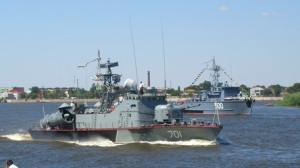 Karachay-Cherkessia is a 206MR project large hydrofoil missile boat (the Matka class is the NATO reporting name), designed to small-sized surface ships combating in the near-shore area. Hydrofoil missile boat Karachay-Cherkessia (serial number 243) is laid down at Sredne-Nevsky Shipyard, Pontonny. Commissioned in 1978. Before July 2004 named as R-50.